Working together with Burke Rehab Hospital, their staff and clients has been an amazing experience. From their top SCI doc, Dr. Stampas, to their PT’s, OT’s and Recreation Therapists, everyone is committed to seeing their patients make progress in their physical capabilities, emotional well-being and social interactions. One recent event that Push to Walk participated in was one of the hand cycle clinics that Burke hosted in conjunction with Helen Hayes Hospital , and it was great! A variety of equipment vendors were there and had bikes for people to try, lots of volunteers to help and great food. At Push to Walk, we love getting clients to consider hand cycling as a complement to our exercise program, and have brought several newcomers into the sport. With so many choices of bikes, it is important to try a few different styles to see what is more comfortable and easy for you to use. We can also tailor your workouts to include specific exercises that will help you become stronger and make cycling more enjoyable. Using a hand cycle can not only be a great way to exercise, but a fun and social activity with friends and family, too. While you may not think October is the time to think about an outdoor sport, you may want to start looking into different models, talk with people who ride, and start considering your options for the spring. 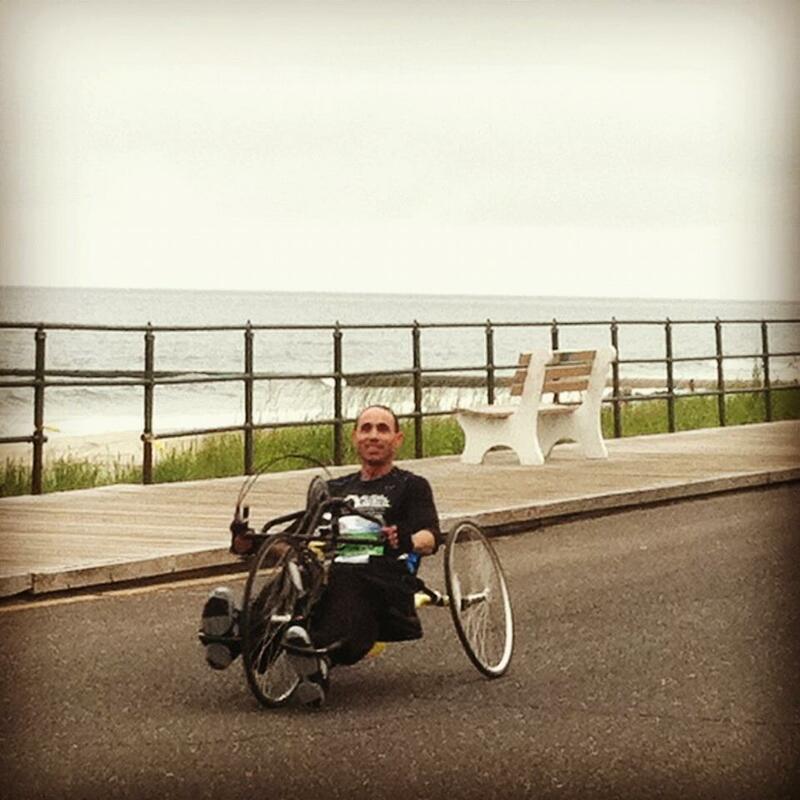 There are several events that would be great to train for, especially Team Push to Walk’s participation in the NJ Marathon/Half Marathon on May 5, 2013, and the annual Richard West 5 Mile ride on Long Beach Island in June. We’d be happy to provide you with information on hand cycles and the events mentioned above – please e-mail me at ctempleton@pushtowalknj.org. We are already signing up team members for the May Marathon, and would love to recruit hand cyclists and more runners, too! All funds raised are used for client scholarships at Push to Walk. We’d love to have you join us! Congratulations to all of our Team Push to Walk members for their participation in this past weekend’s Half and Full Marathon in Long Branch, NJ. They did awesome!! Every member of the Team committed to complete the distance and raise funds for Push to Walk and Dr. Wise Young’s SCI Clinical Trials for a Cure. Our preliminary amount raised was almost $28,000, but we still have to tally the final figures. Thank you to all 22 people who ran or rode their hand cycles to benefit Push to Walk. One of our clients, Celso, pictured here, was the FIRST person to break the finish line tape. It was his first event, and he is excited to pursue the sport further. When he becomes famous, we can say “it all started at Push to Walk…………” Ha ha! Current and former clients, client family members and friends, and friends of Push to Walk all joined together for a common goal – to support Push to Walk and provide scholarship funds to people with spinal cord injuries who need our program but are unable to pay the full amount. Our scholarship fund will help offset the cost of the program for some who would not otherwise be able to come for exercise workouts. Financial barriers are often the main reason why people don’t come to Push to Walk, or stop coming after a period of time because their money runs out. Our runners and riders committed themselves to our cause, and we are so thankful for their interest and dedication. Thank you!!! As part of Team Push to Walk, my son Darren will be riding his hand cycle in this Sunday’s NJ Marathon in Long Branch (May 6). He is one of 5 clients on the Team, and I have witnessed the transformation of some of them during their training. I am so proud of everyone! My husband & I have had the opportunity to ride several times with Darren as he trains. Each ride, I see him getting stronger and more prepared to go the distance. In between outdoor rides, he has been using a SCI-FIT hand bike either here at Push to Walk or at a gym near his apartment. After yesterday’s ride, I am confident in his ability to do the entire distance of 26.2 miles. I know he can do it! What he found yesterday, though, was how important it is to be well fueled before the race! Just as a car needs enough gas to get from point A to point B, so does an athlete for an endurance event. Rest, food and hydration are all key components of a successful event. Fortunately, he experienced how he felt from not having enough to eat this week, and now be better prepared for next week. For all you athletes preparing for the big day – eat well and eat properly several days prior to the event. Better preparation will definitely pay off! Thank you to all of our clients, and their families and friends who are participating on their behalf, as well as our Push to Walk staff and friends who are committed to our cause. So many people have dedicated their time and fund raising efforts on our behalf, and your support will enable us to offer Scholarship Funds to our clients and support Dr. Wise Young and his SCI clinical trials. Have a great race, everyone! I’ll be there cheering you on! One of our Push to Walk clients attended the Expo and saw some really cool stuff. After mentioning how he’d love to have one of the things he saw, he quickly acknowledged that the price tag was beyond his means. First, it seems like “stuff” for people with disabilities is just so darn expensive. As soon as something is described as helping people with disabilities, the price tag goes up considerably. For people that are handy and creative, they often build or rig something up for themselves that works just as good if not better than a product they could buy. This happens way too often, and it upsets me. I don’t know the business of manufacturing and distribution, but I do know equipment is very expensive and customer service is lacking in many, many companies who provide products to people with disabilities. For sports and recreation equipment, there are a few resources that are worth checking out for individuals who want to buy their own stuff. I know there are requirements and guidelines for applying, but with persistence and some hard work, you might just find funding to help you. Check out the Travis Roy Foundation (www.travisroyfoundation.org), the Kelly Brush Foundation (www.kellybrushfoundation.org), The Challenged Athletes Foundation (www.challengedathletesfoundation.org) and Freedom on Wings of Sport (www.wingsofsport.com). Maybe one of these will fit your needs and you can apply for funding. Also HelpHOPELive, formerly NTAF (www.helphopelive.org) can help you set up a fundraising plan to assist you in your efforts. While these approaches may be time consuming and tricky to navigate, it might be worthwhile in the long run. Check them out so you can go out there and have some fun. Let me know how it goes. I’ll be waiting to hear from you!